Posted March 24th, 2009 at 10.20am in Ongoing Priorities. President Bush presided over a $2.5 trillion increase in the public debt through 2008. Setting aside 2009 (for which Presidents Bush and Obama share responsibility for an additional $2.6 trillion in public debt), President Obama’s budget would add $4.9 trillion in public debt from the beginning of 2010 through 2016. 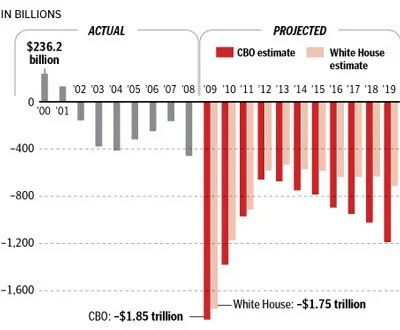 CLARIFICATION: Of course, this Washington Post graphic does not perfectly delineate budget surpluses and deficits by administration. President Bush took office in January 2001, and therefore played a lead role in crafting the FY 2002-2008 budgets. Presidents Bush and Obama share responsibility for the FY 2009 budget deficit that overlaps their administrations, before President Obama assumes full budgetary responsibility beginning in FY 2010. Overall, President Obama’s budget would add twice as much debt as President Bush over the same number of years.